Are you surprised that the season four premiere of “The Walking Dead” shattered ratings records? We’re not. AMC has announced that Sunday’s episode, “30 Days Without An Accident” was the highest-rated episode in the series’ history. The episode brought in 16.1 million total viewers with 10.4 million adults in the coveted aged 18-49 range. The season three finale comes in second place with 12.4 million total viewers, 8.1 million in the 18-49 age range. 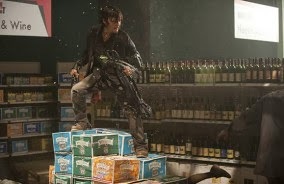 “The Talking Dead” also broke records and totaled 5.1 million viewers. These numbers are huge given that the shows competed with some big sporting events. Given these ratings, we know you can’t wait for season four’s second episode, “Infected” so we’re including a peek. Things started off fairly pleasant in episode one but things have clearly gone down hill real fast. We wouldn't have it any other way.